Lovely Gini, may your memories always be wonderful and joyful. This is beautiful. I wasn't following your blog last year so the collage was new to me. Your mother and grandmother would be so proud. Thank you, Kathy. Mom actually did get to see this collage on my Mother's day post last year. I remember her saying how much she loved it and that photo of her and her mom . 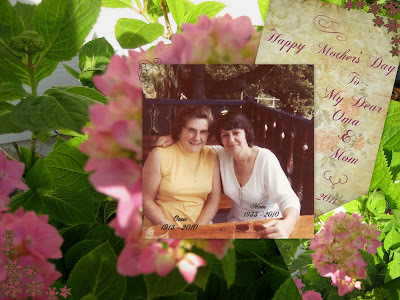 . . we had just lost my Oma (mom's mom) in April 2010, so Mothers day was difficult for her . . . this had brought a smile to her beautiful face. The first Mother's Day without your Mum is so hard. Been there, done that, and my heart goes out to you.